Gallery SeeScape: who am i? wass mi name? 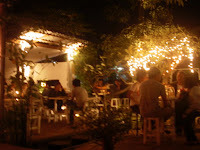 seescape is a bar located on nimmanhemind soi17, chiang mai. it is a place where aesthetics and art can be expressed freely while managment is restful. a small house surrounded by the shady garden and tiny pond, laid back music and adequate art space make it outstanding. recently, wunderspaze has temporarily takenover the space and holds action parties#2 which the 1st was made out in Singapore by khaihori ruddin, wunderspaze's director. action parties#2 is to lend the space for one day for whoever creative and fun. it will only take place on Fri-Sat for 3 weeks. 6 teams had selected and 4 parties are already proceeded.